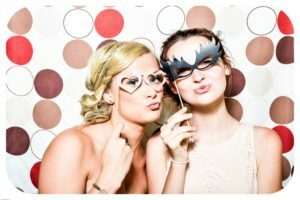 You are planning a baby shower and there will be games to play. 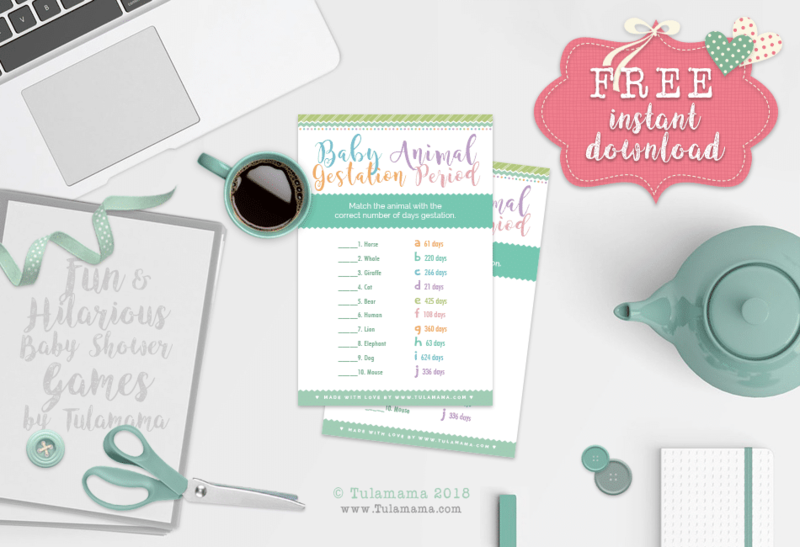 What’s better than printing out fun & free printable baby shower games? The answer is simple – the only thing better than free stuff, is really “fancy” free printable baby shower games! 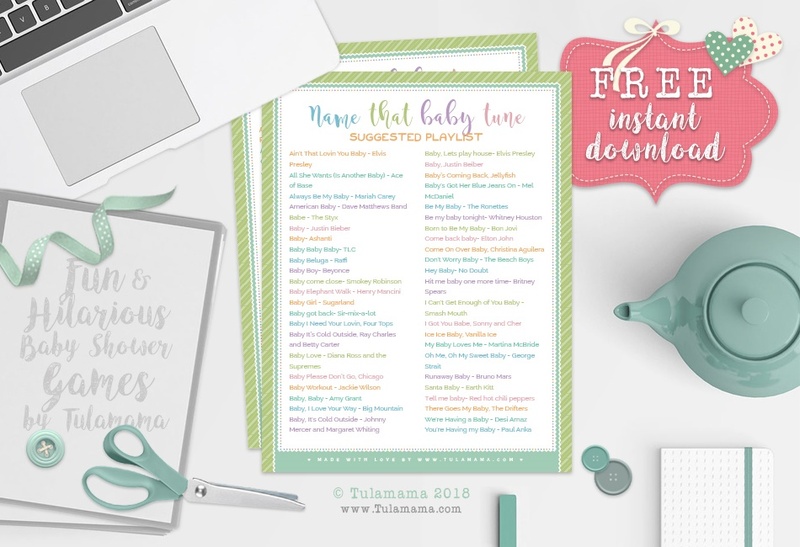 All too often you get free printable baby shower games, but you’d rather not waste the ink to print it because the “free baby shower games”, are just not worth it. They’re kind of average, and they certainly won’t impress the guests. I know how you feel. I was there. Which is why we’ve hooked you up with really nice printouts, which you can use to impress your guests. Our free printable baby shower games with answer key – all have the same neutral pattern, which means you can use them for boys and girls. Also – the colors are perfect to blend with almost any theme you are planning on. Purchase 10 containers of baby food. Remove the labels carefully but as you do so, write a number (1-10) under of the container, as well as on the back of the label, which you just removed. Remember, the number on the container must correspond with the number on the back of the label. Put the tags in an envelope, to reference them later. You will need these labels to choose the winner. On the day of the shower, bring out all the containers and display them. Your visitors will have to guess what type of food is in the container, by smelling and/or tasting it. The most with the most correct guesses, win. Click here to download unlimited copies. This is not a timeless baby shower game, yet it might turn into one because it’s really popular. Print out a sheet for everyone, and have them complete it. The points are based on what they have in their phone. The person with the highest score, wins. Click here to download unlimited copies of the”what’s in your phone baby shower game”. The visitors get a list of questions about mom-to-be, which they need to answer. The visitor with the most correct answers, wins. “Who knows mommy the best” is a really popular game. Download unlimited copies of “who knows mommy the best,” free printables. 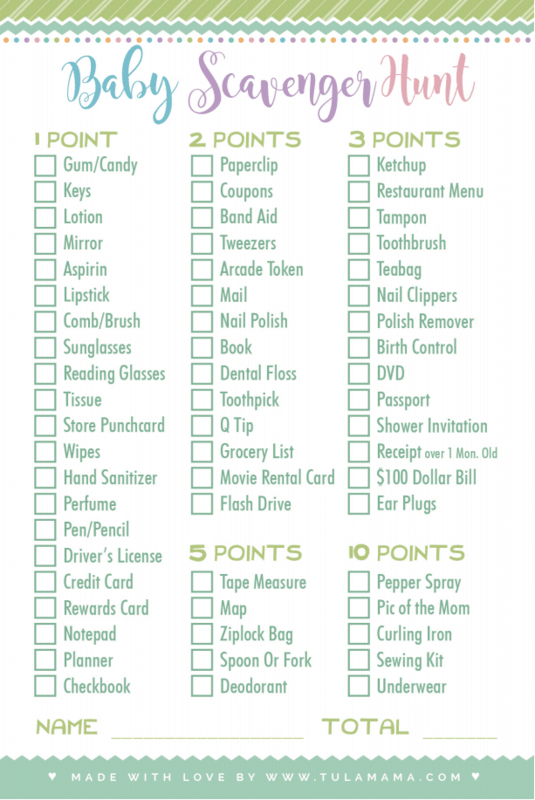 Your baby shower guests go through their purses and they get points for certain items on the list. They complete the sheet and the person with the most points, win. Click here for your free “what’s in your purse” download. 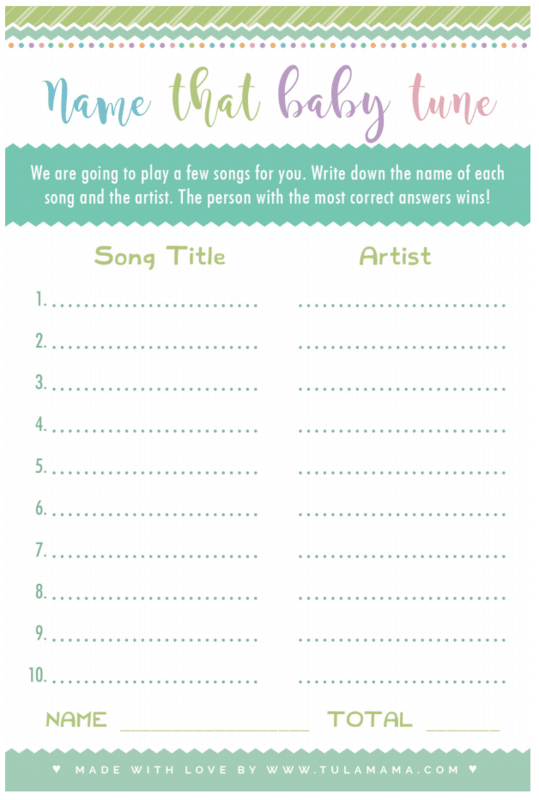 This is a wonderful baby shower game for people who know their music. It’s the kind of baby shower game where people can really get excited and involved. Although – there is some advance preparation involved. Here’s how it works: – the host will play music with the word “Baby” or “Babe” in it – for only 10 seconds. The guests need to guess what the title of the song is, and who sings it. The person who has the most correct answers, wins. We’ve prepared everything you will need. In your download, you get a suggested playlist, so you will have lots of songs to choose from. Whatever songs you choose, you can play it from a cd that you’ve burned, or you can create a playlist on your smartphone. Be sure to print one playlist for the host/DJ, and print enough answer sheets for all the players. Click here to download your playlist and sheet. This game is similar to “Name that baby tune” above. But, if putting together a playlist seems like too much work, you could let your guests guess song titles with the word “baby” in it. You could use the same free download we offer above. Give your visitors time limit of no more than 5 minutes. Whoever has the most real songs, wins a prize. (Made-up songs don’t count)! A classic! As your guests arrive, everyone gets a clothespin to put on their shirts or dresses. Whenever you hear someone says “baby”, you can take their clothespins. The shower guest with the most clothespins, wins. This is one of the top baby games – it’s really popular! Here’s a free download so that you can display it at the shower. 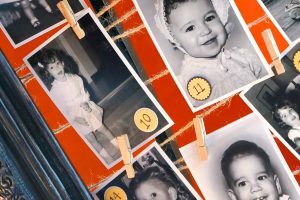 Check out this post on how to make your “Don’t Say Baby” Game, stand out! You will find ideas on decorating the clothespins and framing the poem too. Click here to get your Don’t Say Baby Free printout. Does the new mom need diapers? Of course, she does. Having a diaper raffle is a great way to get her those diapers. 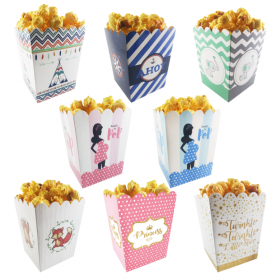 Now, you can use a diaper raffle to get your guests to bring some. All you need to do is include raffle tickets in their invitations. This is really smart because you’re not asking them to buy raffle tickets. Bringing diapers IS their ticket to being included in the raffle. Here are some great free printables. 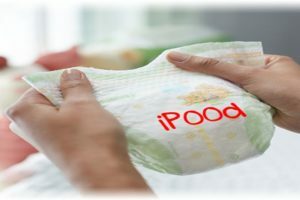 They can be handed out at the shower as you exchange the diapers. 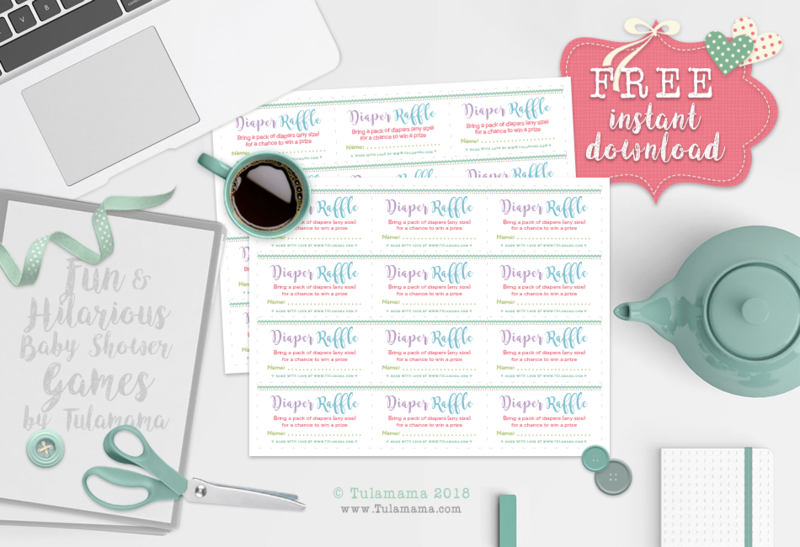 Click here for your Free Downloadable Diaper Raffle Tickets. This is a sweet baby shower activity – one that the mom-to-be can cherish for a long time after. Preprinted cards are given to the guests. They have to fill in their wishes for the new baby. Responses could be read out loud. Click here for your Free Download of “Wishes for Baby”. Baby jeopardy is almost exactly like jeopardy on tv. The same rules are followed, as with regular jeopardy. This game is very involved and requires a bit of preparation. You’d be best advised to prepare this a few days before the baby shower. 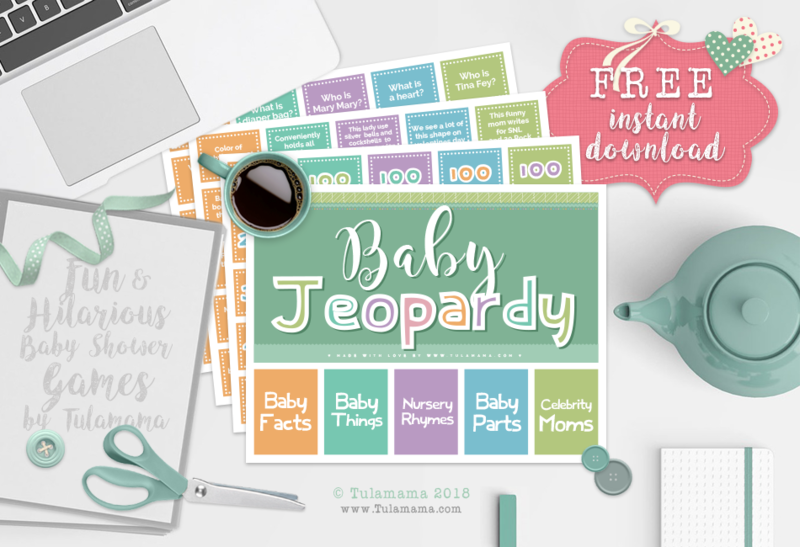 Click the link for free baby shower jeopardy downloads. Moms of toddlers and preschool teachers will win this one, hands down. 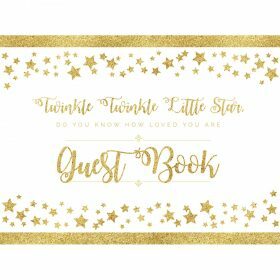 Your guests receive a list of nursery rhyme phrases from popular nursery rhymes. The goal is to name the title of the nursery rhyme. The player who has the most correct answers, wins. Interested in nursery rhyme or book-related baby shower games? Check out my post titled Nursery Rhyme & Storybook Baby Shower Games. Click here to download your free Baby Shower Nursery Rhymes Game. This is somewhat of a classic and it’s an easy baby shower games. Everyone stands up. Mom-to-be or the host starts reading the instructions from the free printable baby shower games. As she reads, guests will start to sit down, based on what she reads. She continues to read until there is one person standing. That person is your winner. If, however, there is more than one person standing at the end, go to the bonus round until one person is left. Click here to download unlimited free copies of the Stand Up Sit Down Baby Shower Game. This one should be considered a classic because it’s been played so long, but the names in the game change as new celebrity babies are born. The game is simple – if you know your celebrity babies. Match baby’s name to the celebrity couple. The free printable includes the answer sheet for the host, as well as the games for the guests. Click here for unlimited copies of the Celebrity Baby Name, Baby Shower Game. Yet another classic baby shower game. The goal is to guess the name of baby animals, like piglet, lamb, etc. The person with the most correct guesses, wins. Download your unlimited copies of the Animal Babies Game, here. In this game, participants have to guess how long the baby animal stays in the mama animal’s womb, before it is born. Download unlimited copies of the Animal Pregnancy Baby shower game, here. 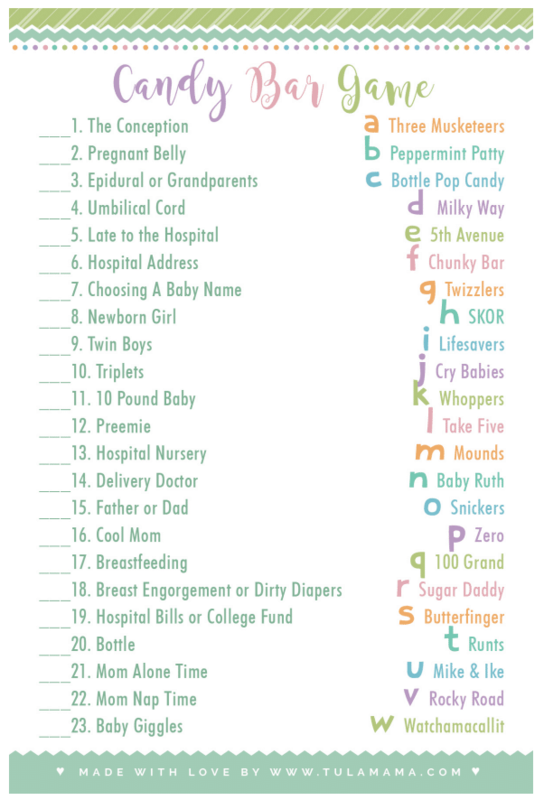 Yet another fun baby shower game, especially if you know your candy bars. It’s simple – just match the pregnancy-related word to the chocolate candy bar. For more detailed information about how the Baby Shower Candy Game works, check out this sweet post. Click here to download your copies of the Baby Shower Candy Bar Game. Your free printout and answer guide offers a list of alternative names to popular children’s books. This goal is to figure out the real names of the books. The person with the most correct answers, wins. Click here for your free download Baby Shower Children’s Book Game. This is a fun and delightful little printout, which you can only play if the baby’s gender is unknown to the guests. Guests get to guess the gender, birth weight, etc. Exciting! Here’s the free download of our Baby Prediction Cards. All you will need are the printouts, pencils for the guests, and a timer. Based on the alphabet, guests race to write a word that has to do with babies. The guest who has the most baby words, wins. Grab your unlimited, free copies of The Baby Alphabet Game. This is a classic game, baby style. Baby shower bingo, like baby jeopardy above, will need some preparation but it’s worth it. 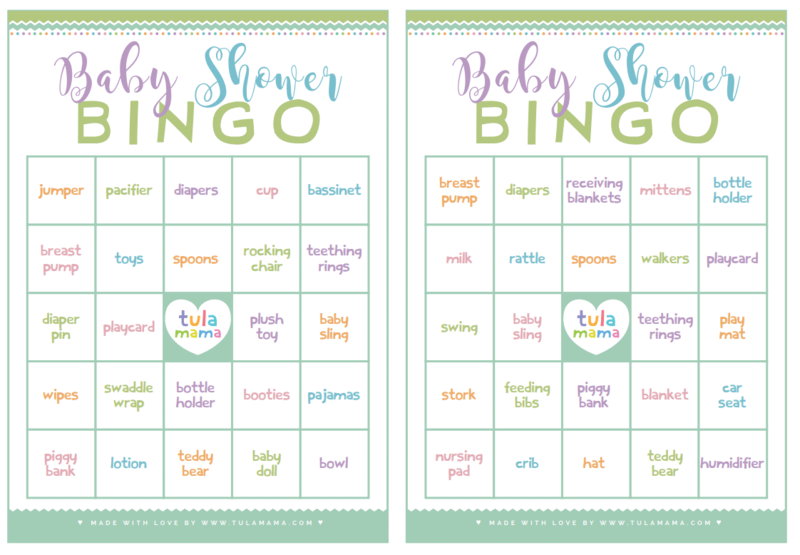 Click here to see your free baby shower bingo downloads. This game will be great for those who know famous tv moms and dads. Match famous TV parents with the TV show. The guest with the most correct answers, win. Need free, unlimited copies of the TV Families Baby Shower Game? 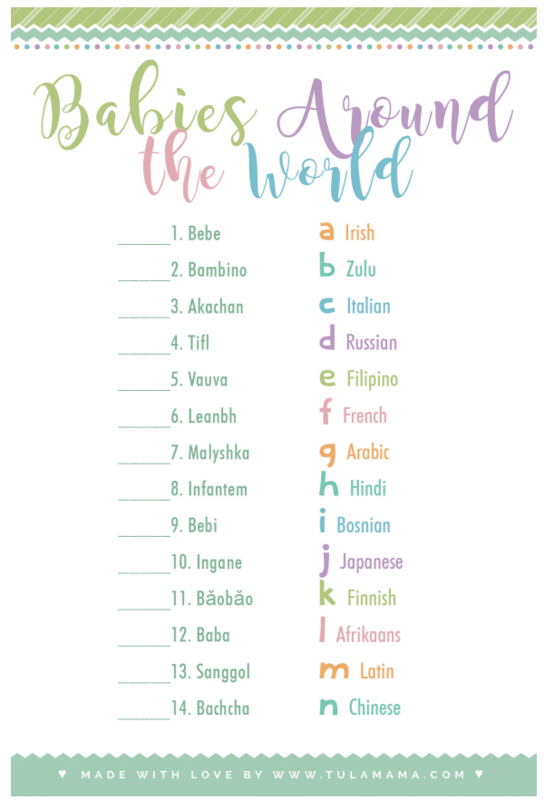 How do you say baby in Chinese, Russian, Afrikaans, Italian… In the “babies around the world” game, guests have to guess. The person with the highest score, wins a prize. Here’s your FREE Baby around the world, download. This game too will require a bit of preparation. The host buys 10 different but commonly used baby items from a store where most people shop, like Walmart, Target, etc. Choose a variety of different things with different prices, like wipes, bibs, baby food, nail clippers, diaper rash cream, etc. Don’t lose the receipt! You will need it close for when you play the game because your guests will need to guess the price. If you plan on using the free printable download, be sure to buy the items on the list. Check out my post about “The Price is Right” Baby Shower Game, where I go into much more detail about how to play the game. Click here for unlimited copies of Baby Shower Price is Right, download. Baby shower mad libs is a fun game that can get quite hilarious. It follows the same rules are regular mad libs, but if you don’t know how it works, feel free to check out the rules and how baby mad libs is played. Click here for your Free Download of Baby Shower Mad Libs. Baby shower trivia is similar to tv gameshow trivia. The host will will a list of questions and the players will need to answer multiple choice questions. The host will need to be the scorekeeper. The person with the most correct answers, wins. For more detail about baby trivia, please check out this post. Click here to print out your copy of Baby Shower Trivia. 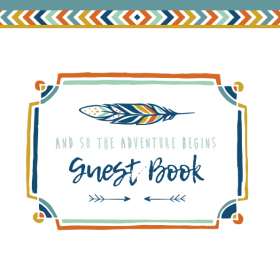 Having a book themed baby shower? You will enjoy our “Name that Storybook” Baby Shower Game. Participants are given a popular phrase or line from the story. This is their clue, and they have to guess from which storybook the clue comes. This game is easy for you to set up – just print out as many copies as you have guests, and hand it to your guests, with a pencil. As always, answer keys are included with your download. Click here to download your unlimited copies of Tulamama’s Storybook Baby Shower Game. 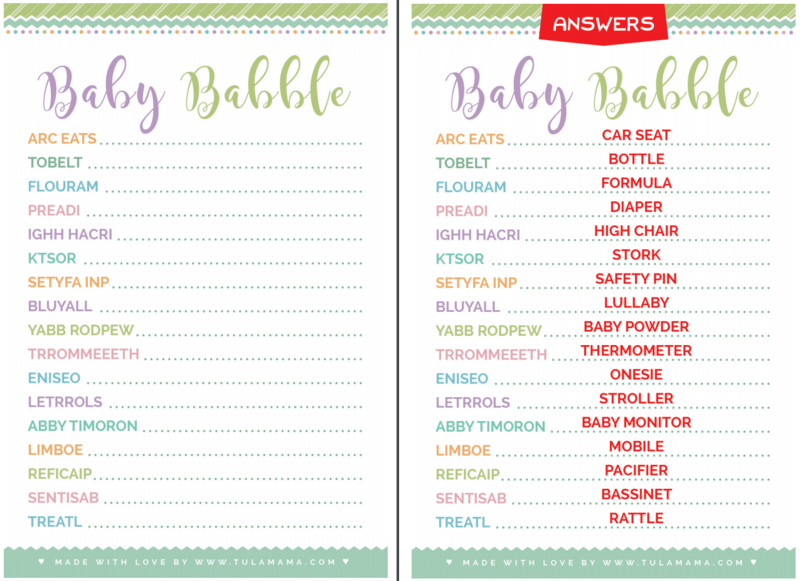 Baby Shower Word Scramble – yet another classic baby shower game. It is as old as the hills. The idea is that your guests have to unscramble the baby related words. The first person to complete the scramble wins the prize. Baby Word Scramble is really popular! So popular, that I thought that it needed its own – word scramble – post. Here are your unlimited copies of baby shower word scramble. If you’re looking for easy baby shower games, this is about as easy as they come. All you need are the printouts and pencils for your guests. The goal is to find pregnancy/ baby related words in the grid. The first person to find all the words, win! If you ad a 5-minute timer, that would really excite people! 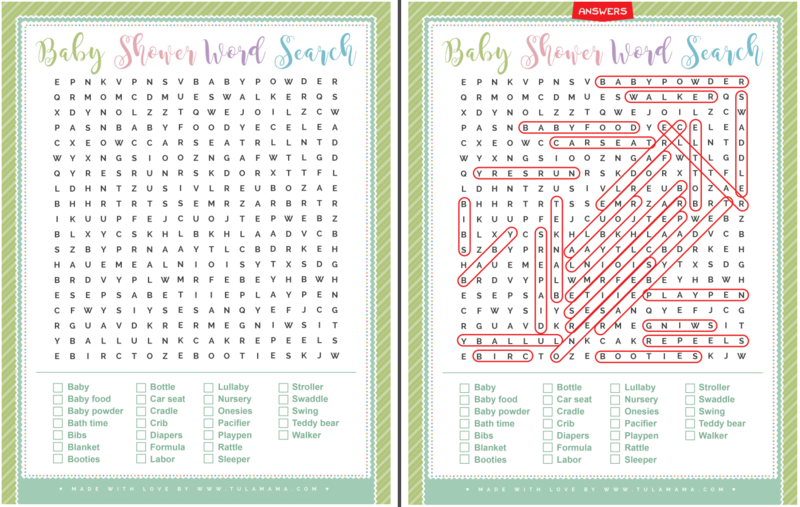 Baby Shower Word Search is yet another popular baby shower game that deserved its very own post. Feel free to check it out, for more details. Click here for unlimited, free copies of baby shower word search. This is an easy baby shower game. All you will need is to print out ONE sheet, which the host will need to read. Everyone starts out in a circle – or as close to one as you can get. 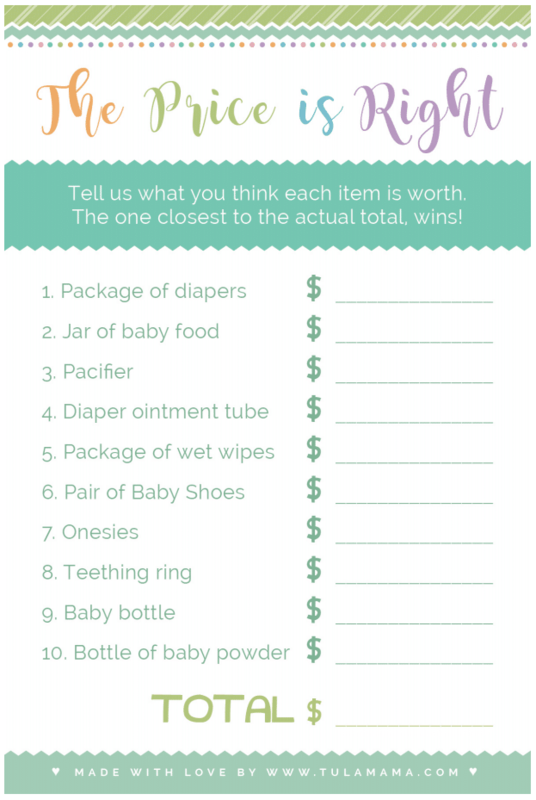 Unlike most other baby shower games, you will need the wrapped prize BEFORE you start the game. Hand the prize to anyone. Now, begin reading the story. The guests have to pass the prize from left to right, based on the story. They have to keep the prize moving in the direction she says until the storyteller instructs them to change directions. The faster they keep it moving, the more exciting. The guest left holding the prize is the winner! This easy baby shower game can be played in large or intimate groups. 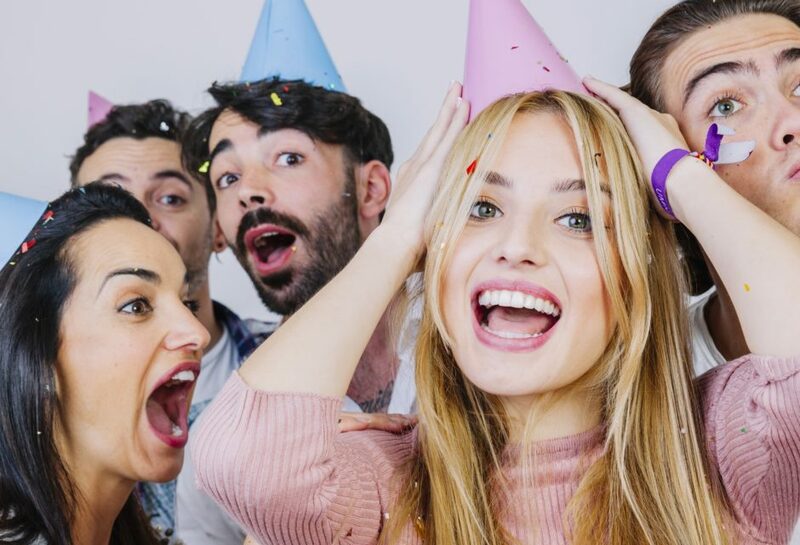 This is an awful lot of fun AND it’s easy, but if you plan on playing this game, you’d be best advised to check out this post, with complete details about group sizes, adding additional prizes for your group size, etc. Download Free Copies of the Left Right Baby Shower Game here. This is a fun, easy game that uses nursery rhymes that are very well known. It’s also a fill-in-the-blank type of game, which should make it even easier. The setup with all our Free Printable Baby Shower Games, is easy. Download, and print enough copies for your guests. Print a copy of the answer sheet (which is included), for the host. If you are planning a nursery rhyme and book-themed baby shower, check out this post entitled: Nursery Rhyme & Storybook Baby Shower Games. Click here to print your unlimited copies of our simple Nursery Rhyme Baby Shower Game. This is a simple and fun baby shower game – and there is not a lot of work involved. All you need is to printouts for each player/ group, and little prizes. You will need to place your little prizes around the house – the answer key tells you exactly where. These prizes can be super simple, like raffle tickets, mints, or baby shower candy. Fun! Baby Shower Scavenger Hunt deserves little bit more detail than the summary I provide here. To check that out, go here. Find your Free Downloads of Baby Scavenger Hunt, here. This game can be played individually, or as groups. This game will also require a printout for each participant. This is not a game for men – only people with purses. While this is also a scavenger hunt, it is nothing like the one above because your guests can be seated while they’re playing. To play, all they have to do is find things in their purses. They get points for the stuff they already have. The person/ group with the highest score, wins. Here’s a complete and detailed post about baby shower scavenger hunt. 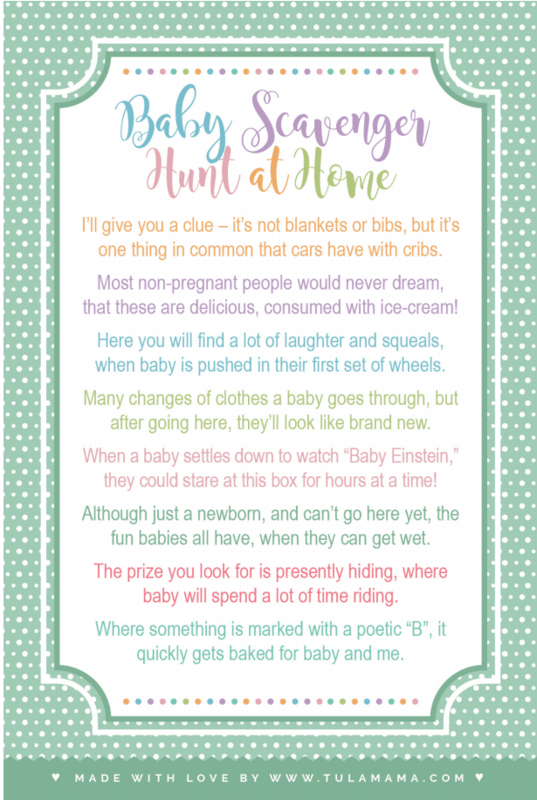 And here is your free Baby Scavenger Hunt download. This too is somewhat of a classic and an easy baby shower game. Everyone starts out in a circle – or as close as you can get. To start the game, you will already need to present the prize. Start by reading the “Pass The Prize” Free Printable Baby Shower Games download. Your guests to start passing around the prize all around the room. When you are done reading all of the phrases, the person left holding the prize is the winner! This game is also known as the “pass the gift” baby shower game. Here’s your Free download of Pass The Prize Baby Shower Game. I hope you will agree this is truly the most comprehensive list of cute and Free Printable Baby Shower Games with answer key. I also hope I didn’t miss anything. If I did, please let me know in the comments. If you have ideas for themes or designs we should be offering, let us know. If enough people start asking for the same theme, that will be our queue to start creating it. Many thanks again for visiting. We appreciate it… a TON! You are most welcome. We aim to please.